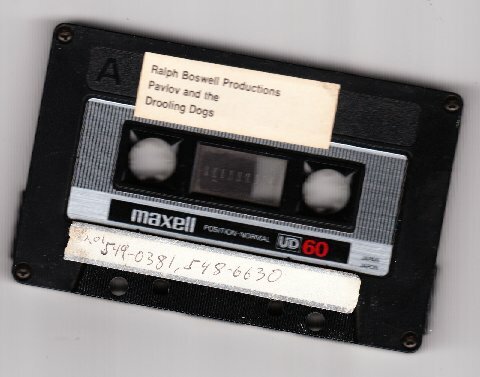 Pat DuBois, the bass player for Pavlov and the Drooling Dogs send me a picture taken by Sean Dineen of an ancient demo tape of ours (probably these copies were used to send to clubs in order for us to get gigs.) You'll notice the "201" area code which makes this tape about 28 years old or so. Man, tapes were so expensive we had to send these out on "normal" bias cassettes. Plus I love how our old home phone number is hand written by me on the label. Here's a funny fact: Tyrannosaurus Mouse does a song that is on this tape. I must have been 18 or maybe 19 when I wrote it. The song is Jabberwocky (using the Lewis Carrol words) and when we do "One two One two through and through" we think about Pat who insisted (rightly) that the whole band accented the quarter notes right there. Do You Like Too Much Compression?